Our little boy just turned two. 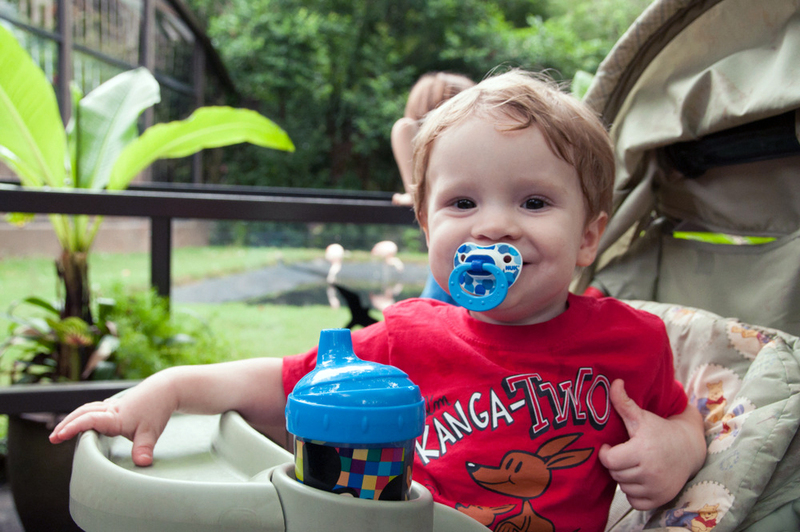 Baby Bear currently has three loves in life – cars, farms, and Curious George – and since two of these things involve animals, I thought it would be fun to take the kids on a field trip to the zoo for his birthday. Wake up at a normal time on Monday morning. Pack a lunch and get the kids ready. Leave by… ehh… 9-ish? Something like that. Visit the African animals first, in case we don’t get to the other ones. Leave before the zoo closes. This plan did not seem complicated enough. It needed more steps. It ought to require more than a 10-minute discussion. But I had to admit, there wasn’t much else I could think to add. Maybe I could plan out the exact routes for which animal we would see, with time slots and everything… but thankfully I’m not close enough to a Type A personality for that. So on Monday morning, we headed off. I had a minor panic attack just as we were about to leave that maybe the zoo was closed for some crazy reason and we might make that 2-hour trip for nothing, but thankfully a quick phone call settled that question. I was still a little apprehensive that something might go wrong… We were a bit on the late side of what I was hoping for, the sky was looking somewhat weepy, and we had neglected to pack an umbrella. But we made it safely to the zoo about noon, and by that time the sky seemed to have gotten its emotions under control. “Moo,” he said flatly, and wiggled to get down. This first reaction soon showed itself to be a pattern, and I realized the major flaw in my plan: Baby Bear just didn’t find the animals all that interesting. At least, not compared to running up and down all the cool trails around the exhibits. I have a feeling that if the animals had been a bit noisier, he would have paid more attention, but they were all pretty chill that day. Probably the most interaction I saw between them and him was when he saw a cougar right up against the wall of its display, and he ran back and forth shouting, “Hi, puppy!” as the huge cat stalked along the glass, watching him rather hungrily. 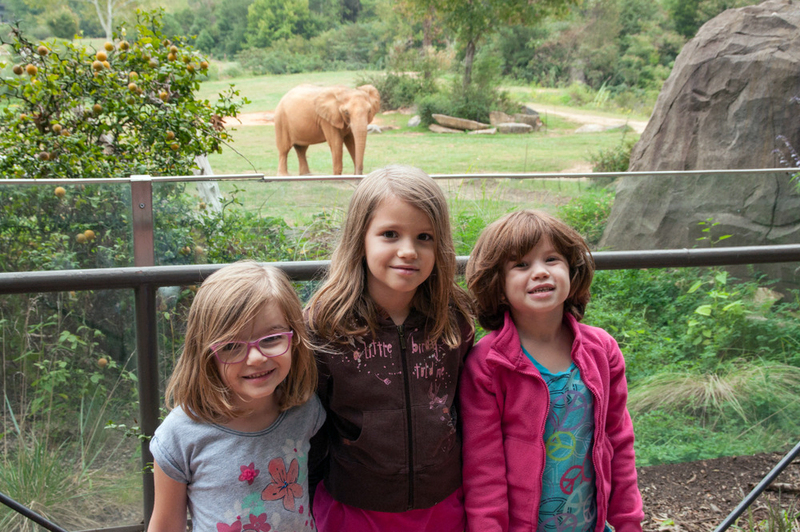 The girls, on the other hand, were quite enthralled with the animals. My second-grader was super excited about seeing the lions (her favorite animal), and they all enjoyed watching the young chimpanzees wrestle. They burst out laughing when one of the gorillas slapped his hand up against the display glass, and they watched, mesmerized, as the polar bear swam right toward them, pushed off the glass at their noses, and looped back around several times in a row. We got to have a close encounter with a giraffe as well. As diligently as I had tried to study the map, I had not noticed a special observation deck where at $2 per person, you could approach and feed a giraffe standing right there. 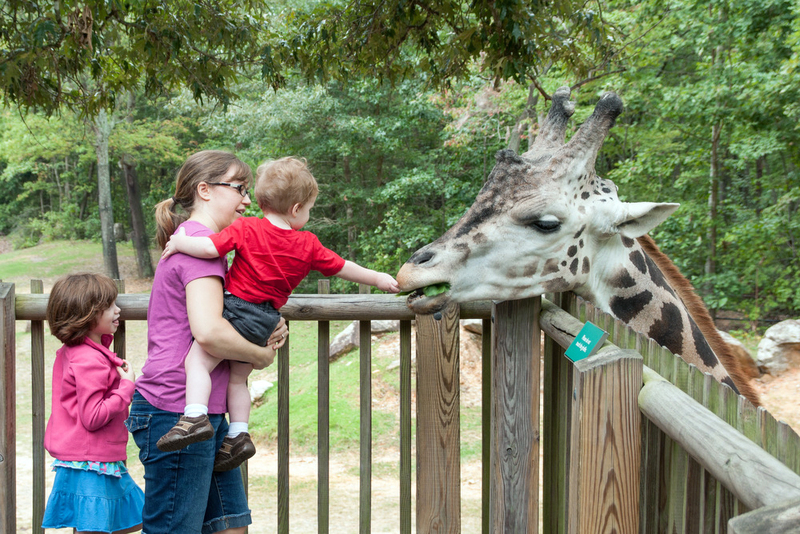 No, that extra $10 was not on my original plan, but how often do you get to feed a giraffe?! The caretaker even dragged my husband over (who was trying to save us $2 by standing back and taking pictures) and told him to forget about the money… he didn’t want to have my husband sitting in his rocker one day regretting that he had missed this opportunity. All in all, it was a great day. The weather turned out to be perfect. We didn’t end up seeing every one of the animals, but the girls very much enjoyed the ones we saw, and Baby Bear had a blast running around the trails. It did not all go exactly how I had imagined, but when does it ever? The truth is, no matter how well I may map something out, things will never go quite how I think. It is good to have some kind of plan… (I’m glad I packed our lunch, for instance, rather than paying out the nose for the food on location.) But it’s also important not to get too attached to the idea of a perfect plan. It probably won’t go how you think, but you never know… it might just go even better. Photo Credit: All photos taken by Jessica Cole, edited by Charity Klicka.